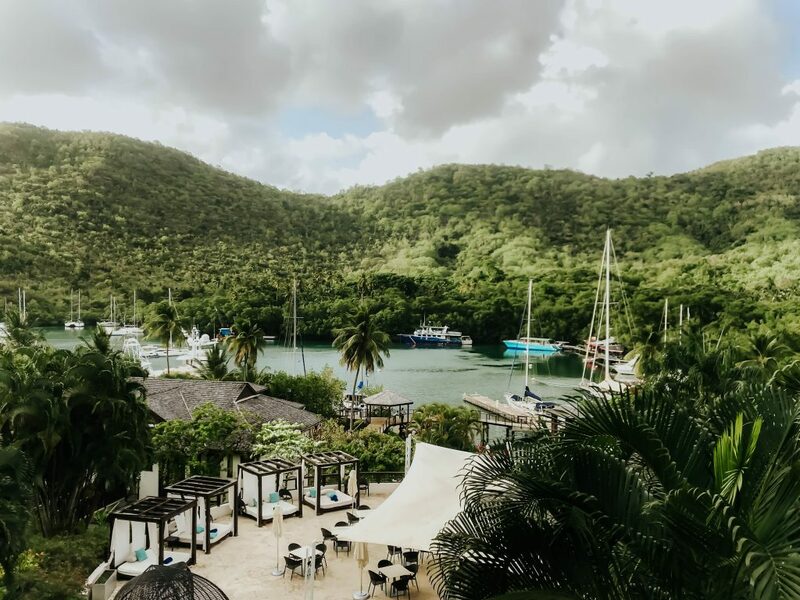 Nestled amongst lush, tropical gardens and with a view out over sleek yachts in the marina, Marigot Bay Resort and Marina offers something slightly different in Saint Lucia. 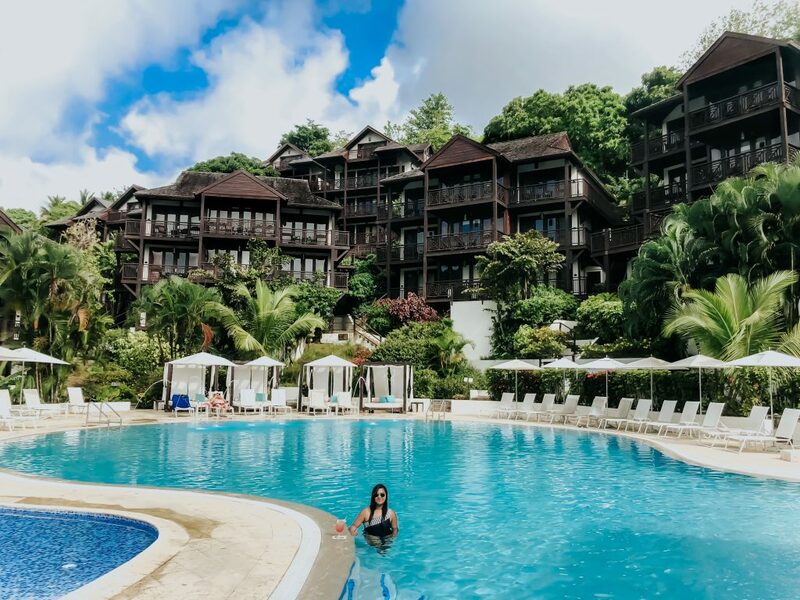 The resort and beautiful tropical surroundings with warm hospitality captivated my heart during a recent vacation to Saint Lucia. 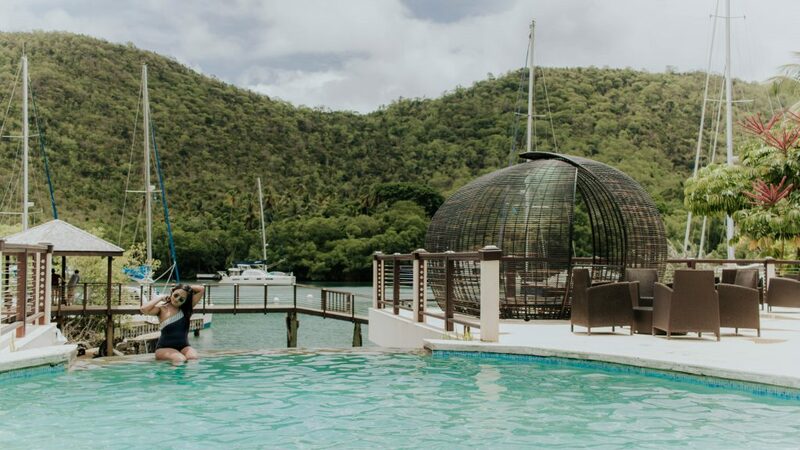 The Marigot Bay Resort and Marina promises to offer genuine Calypso hospitality to ensure that their guests can entirely leave their worries behind and instead immerse themselves in the relaxing luxury of the Resort. I indeed experienced this firsthand when several days before we were due to depart I was emailed by the resort’s personal assistant enquiring as to what we would like to do during our stay and whether they could book anything for us. I appreciated this personalised approach, and it was wonderful to depart London knowing that much had already been arranged and the only thing left for me to do was enjoy myself. 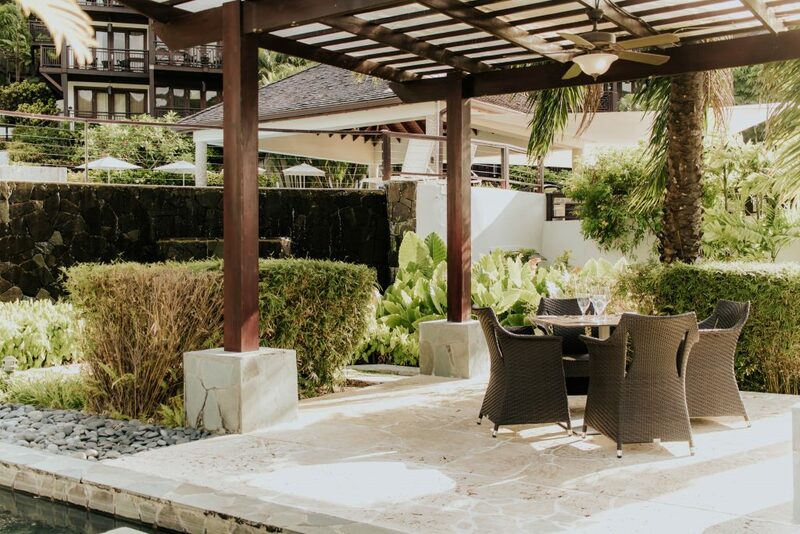 From London, it was an eight-hour flight to Saint Lucia Airport, where a host from the resort warmly greeted us and enquired as to our preference for a welcome drink to be prepared for our arrival at the resort. We then departed for the hotel with a selection of water, cookies and a magazine for the drive. The resort is a pleasant hour’s drive from the airport, and along the way, we got our first taste of the lush green scenery on the island. We also enjoyed seeing some of the beautiful fishing villages which are dotted around the island. 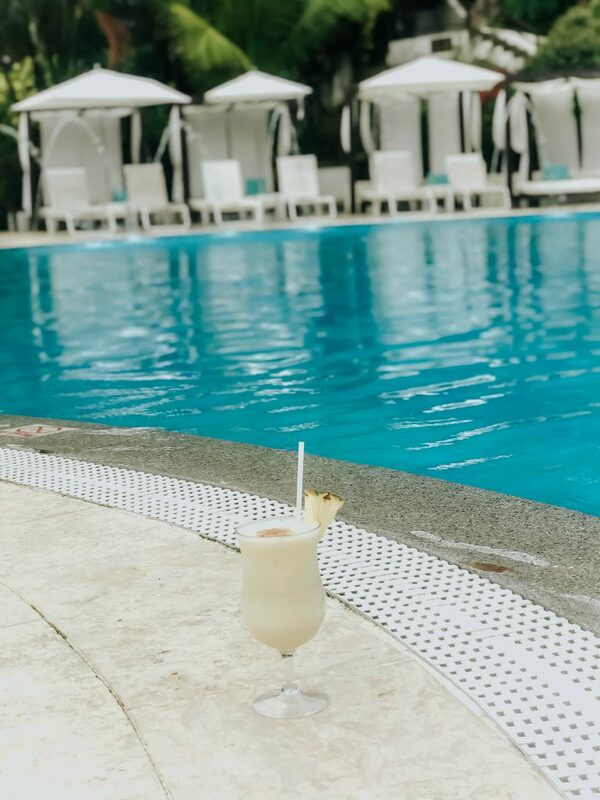 Upon arrival at the resort, we were pleased to find our preferred welcome drink – a refreshing rum punch; the perfect introduction to the Caribbean. With great efficiency and a friendly smile, our luggage soon disappeared as they were carried off by the staff towards our room. We soon followed as the receptionist escorted us to our Bay View Suite. I was immediately enamoured by the sweeping views out over the Marina, looking down at the graceful yachts and their guests. It really was a stunning view. 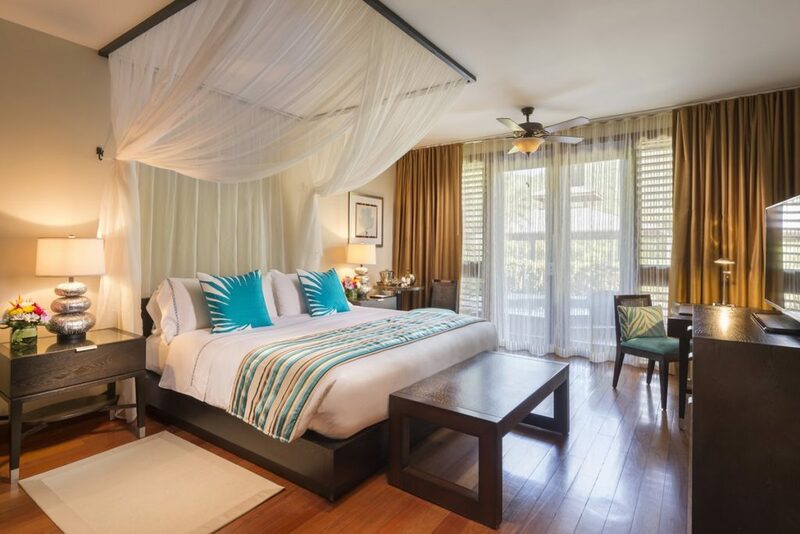 The Marigot Bay Resort and Marina features 124 rooms including 56 suites and exudes the elegance of a time gone by, with stylish contemporary furnishings highlighted with accents of dark hardwood. 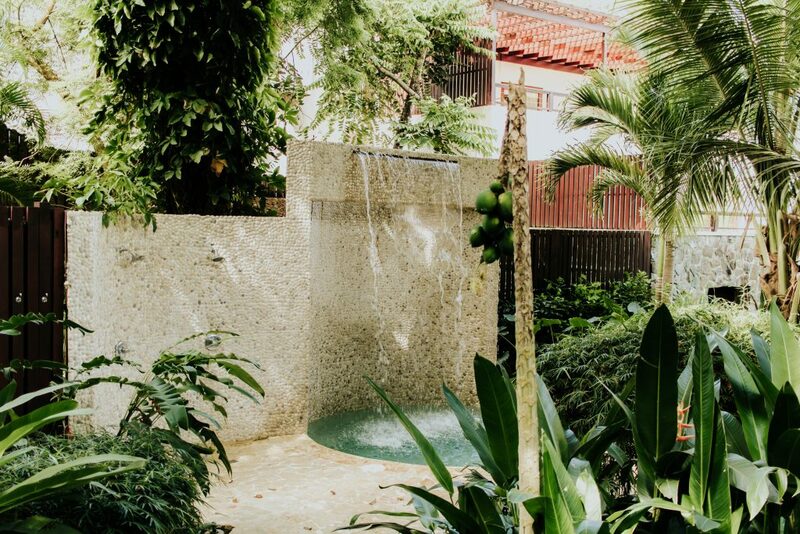 The use of these natural materials means the hotel and its multiple buildings blend beautifully with the lush green surroundings. The hotel’s jewel is, of course, the marina – Marigot Bay has very deep water, meaning it is a perfect mooring for luxury vessels. The sight of these and the glamorous celebrity guests lucky enough to be on board them is a spectacular view in itself. 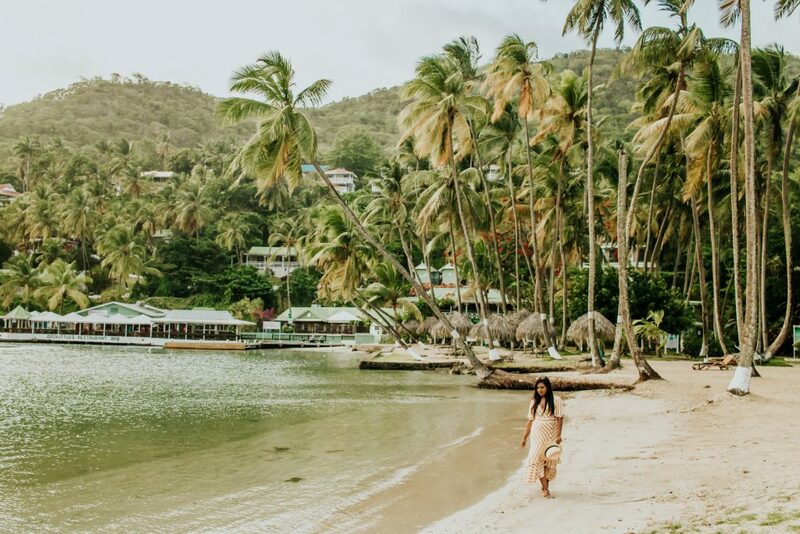 Of course, if you do wish to dip your toes in the sand, you can always catch the free water taxi to the Marigot Bay sandy beach just opposite the hotel. 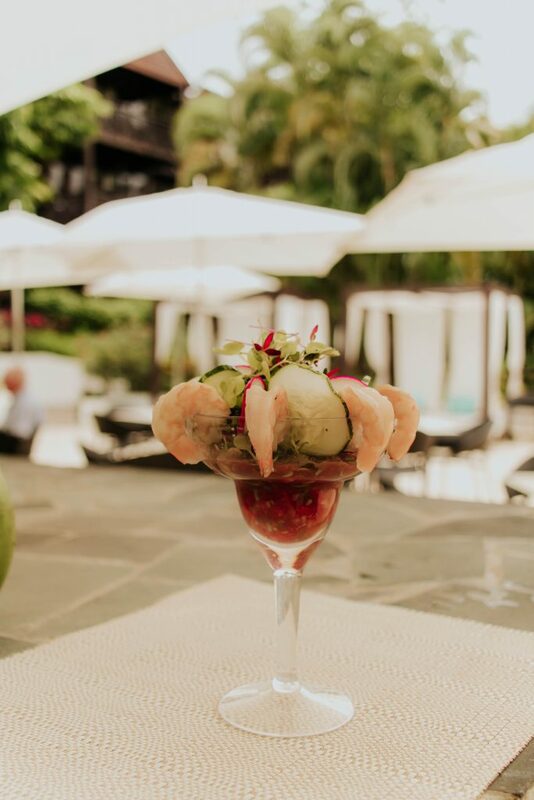 If, however, you prefer to do your swimming at the resort, there are two glistening infinity pools – one reserved for adults only, and the other boasting a chic swim up bar. The resort also features a spa, to ensure total relaxation during your stay. There is also a cute ‘village’ which has an assortment of shops including a grocery store and several apparel boutiques including one by luxury swimwear designer Heidi Klein. 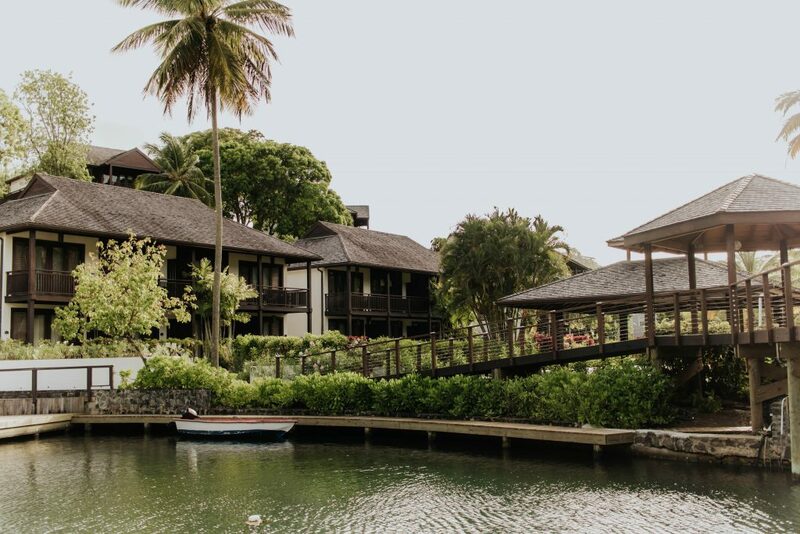 All of the accommodation options at the Marigot Bay Resort and Marina are incredibly modern and stylish, yet seem to have a timeless elegance about them. The rooms featured natural, relaxing décor with occasional pops of colour that add interest without being overwhelming or gaudy. 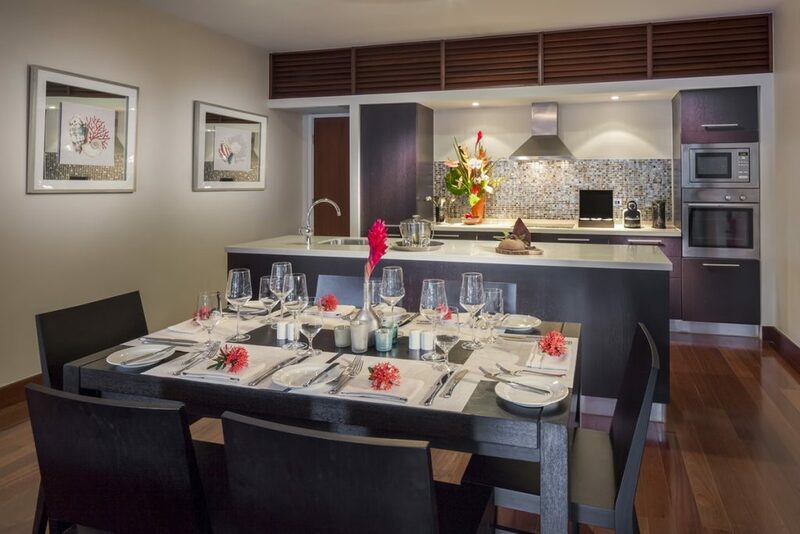 Our Bay View Suite was spacious, with a living room, dining room and kitchenette. There was also a balcony, which we loved, since it was the perfect place to sit with a rum cocktail in hand and watch the sun go down over the glamorous marina. Although the rooms feature all of the modern conveniences you would expect from a five-star luxury resort, it is the little-added touches that really stood out to me. The bathrooms featured luxurious, full-sized designer Aqua Da Parma products, and each afternoon we would be left little treats such as rum and fresh chips for snacks. We even received handwritten notes from the housekeepers which were a lovely additional touch. Food is a huge part of the holiday experience for me, and I’m sure for many others. Luckily, the Marigot Bay Resort and Marina well and truly delivers on this front. 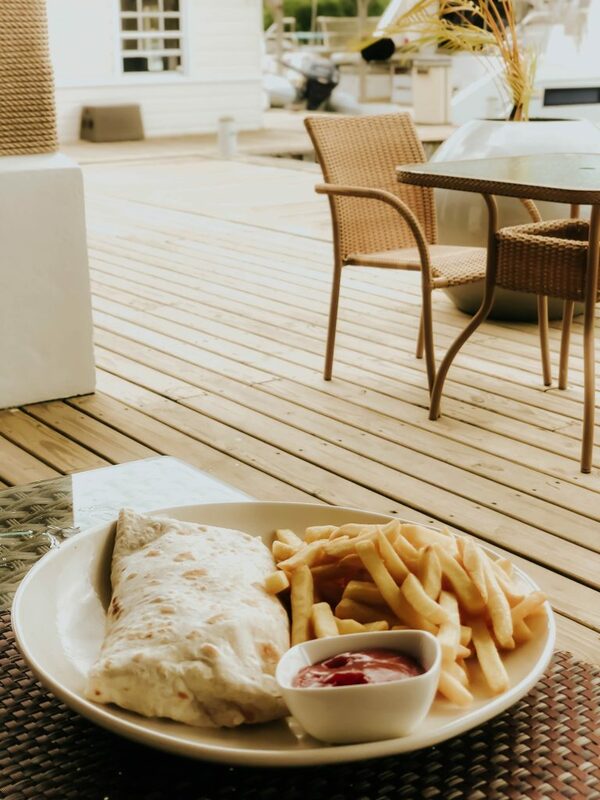 There are four eating options located at the resort, as well as a range of other options available nearby. 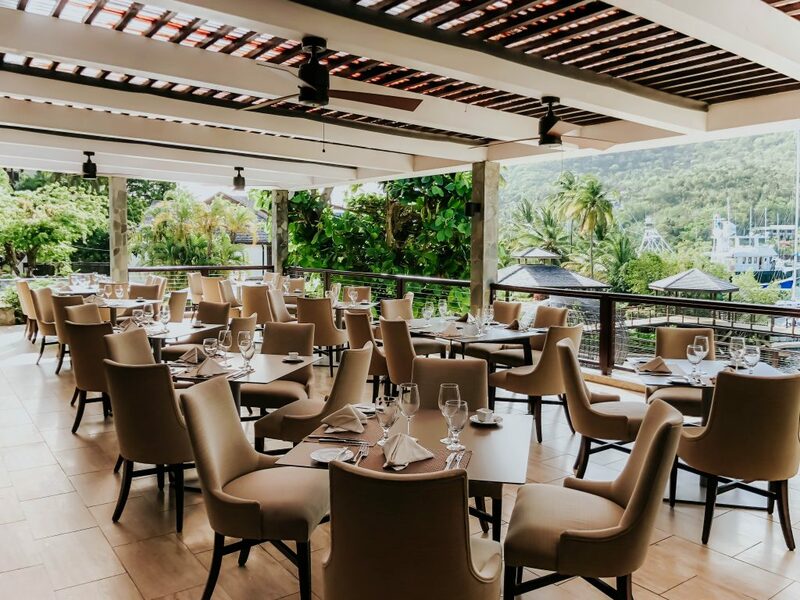 The resort offers an all-inclusive package which is good value if you wish to eat at the resort’s restaurants.We dined at each of the four establishments run by the Marigot Bay Resort and Marina and were impressed with each. 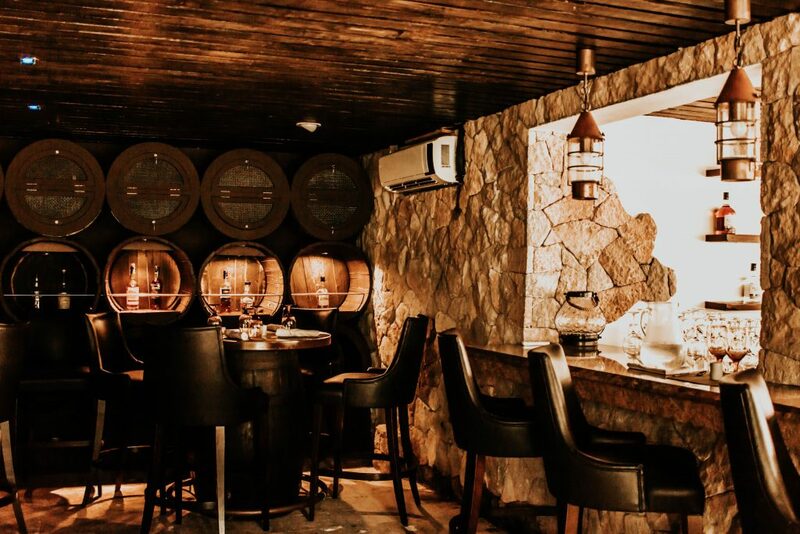 On our first night, we had dinner at the fabulously named Rum Cave, which serves mainly lighter options with a hefty side of Caribbean hospitality and atmosphere. We had our dinner tapas style, meaning my husband and I shared a delicious selection of dishes including honey sesame chicken wings, calamari, ceviche, shrimp cocktail and roasted vegetables. It was all delightful, and the relaxing and informal atmosphere was appreciated. 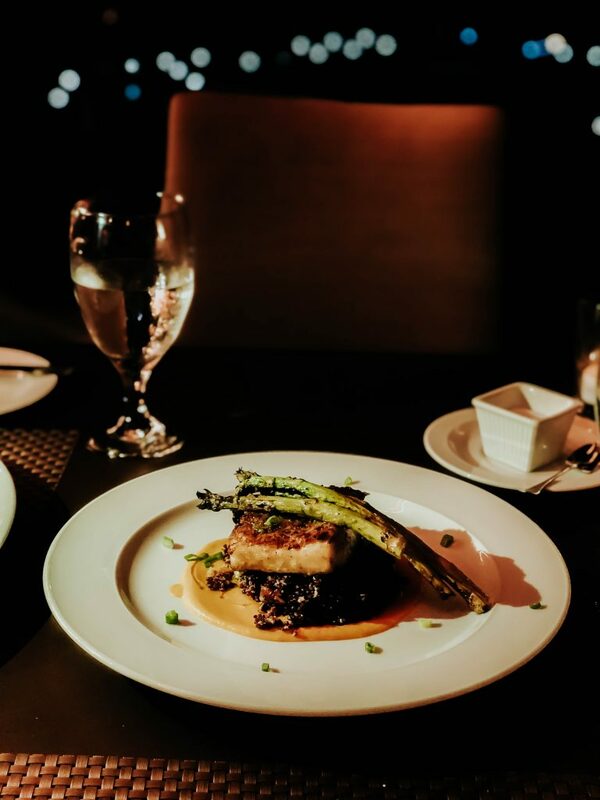 For dinner, on the second night, we tried The Grill at 14⁰ 61, a slightly more formal option where the emphasis is on fine dining. Seafood is the speciality, although there are also vegetarian and other meat dishes. During our visit, it was Creole night with a special menu. I selected the warm conch with spicy creole sauce and plantain chips for the appetiser, and my husband tried the crab cakes. 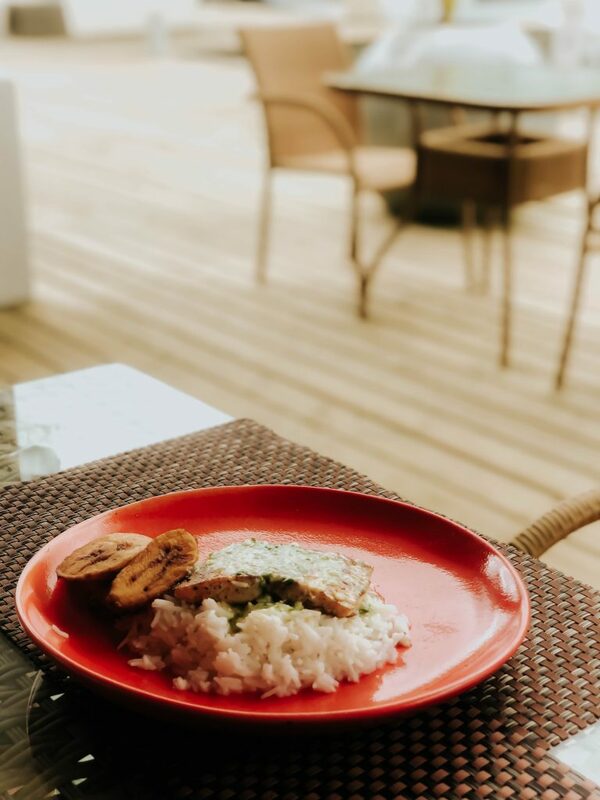 Both were delicious, although the real stars were the mains – for me, mahi-mahi fish wrapped in banana leaf with rice and pigeon peas, and for my husband, roasted kingfish with melted leek, potatoes and pancetta. Both melted in our mouth delicious and finally capped off with a bay leaf cheesecake that we shared. 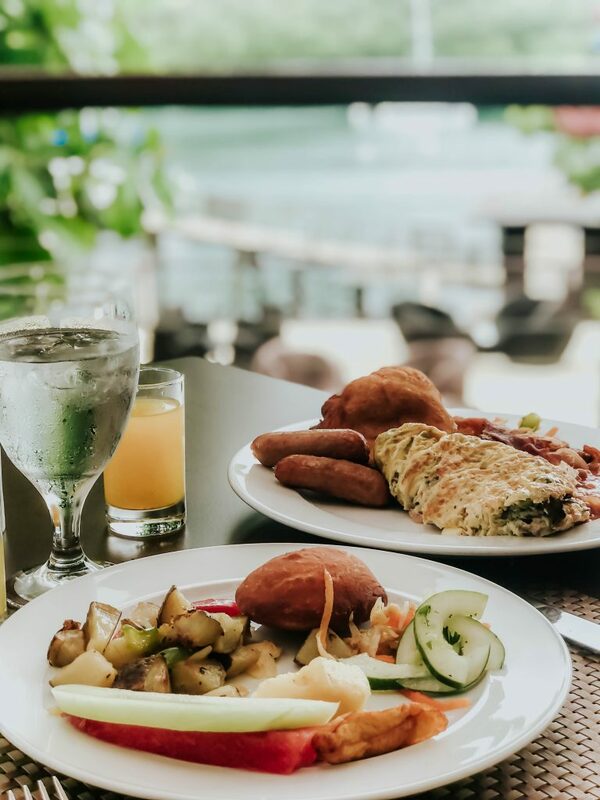 The next morning, we returned to The Grill at 14⁰ 61 for their famous breakfast buffet and a la carte menu – we selected the buffet and we were not disappointed. The buffet had an impressive selection of options, from western favourites to local delights. It was certainly a great way to start our day. Later that day, we had lunch at Brut Bar, which offers sushi and other dishes by the pool. It was certainly very relaxing as we had a delicious lunch made up of the Bloody Mary Shrimp Gazpacho for a starter, followed by a Grilled Fish Sandwich with Caper Aioli, and fresh California Roll as the mains for my husband and I respectively. 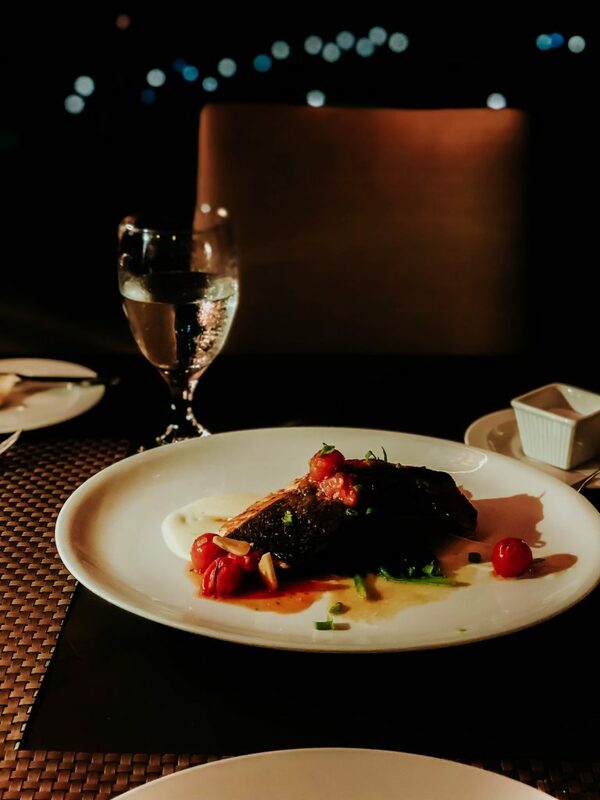 That evening, we again returned toThe Grill at 14⁰ 61 .Having eaten plenty of delicious food during our stay, we decided to forego the starter and dessert to focus on the scrumptious mains. I enjoyed seared snapper with warm red quinoa, spiced pumpkin and coconut oil, whereas my husband had pan roasted chicken breast with creamy polenta, herbed mushroom and white truffle cream, which was cooked to perfection. 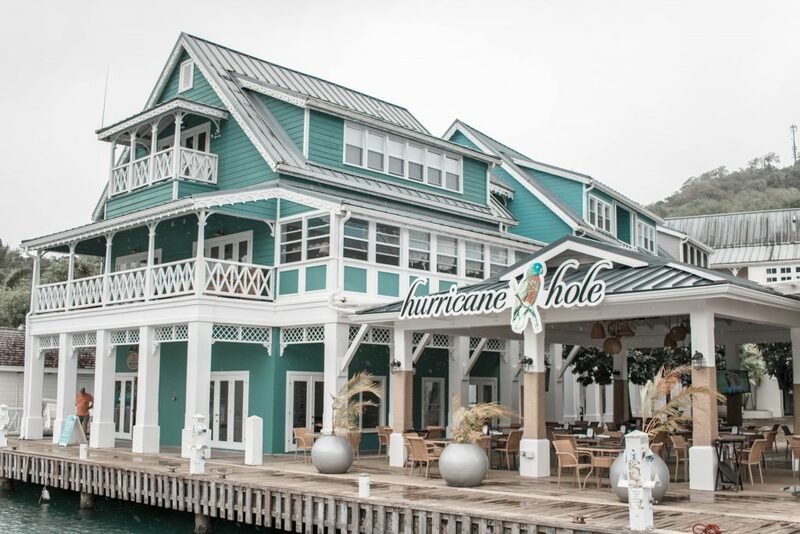 We also managed to catch lunch at the Hurricane Hole, one of the other restaurant and bar that also offer drinks and meals, on our last day. I loved the friendly and relaxed atmosphere as you looked out over the boats and yachts in the marina. I again tried mahi-mahi – this time pan seared over basmati rice with capers, tomato and a butter sauce, whereas my husband had the local speciality of chicken roti. Both were delicious, and a great way to end an excellent dining experience at the Marigot Bay Resort and Marina. 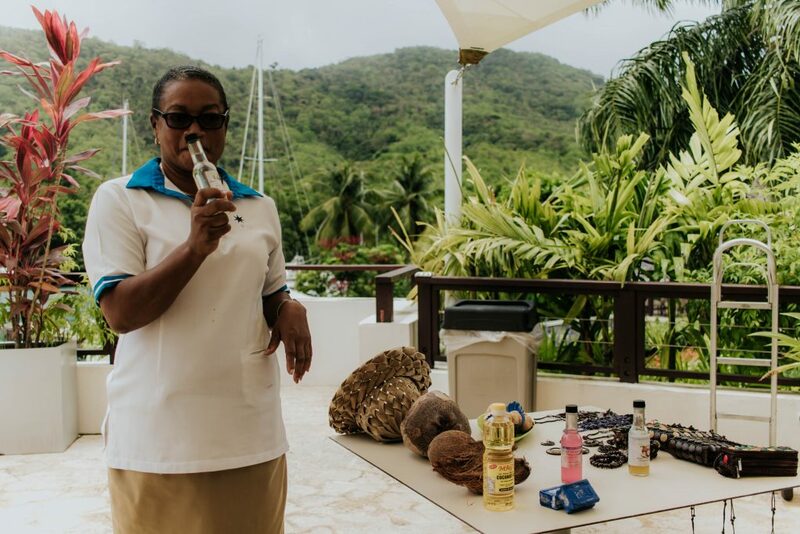 Aside from enjoying delicious food and produce, another favourite past-time at the Marigot Bay Resort and Marina is indulging in a luxurious spa treatment. 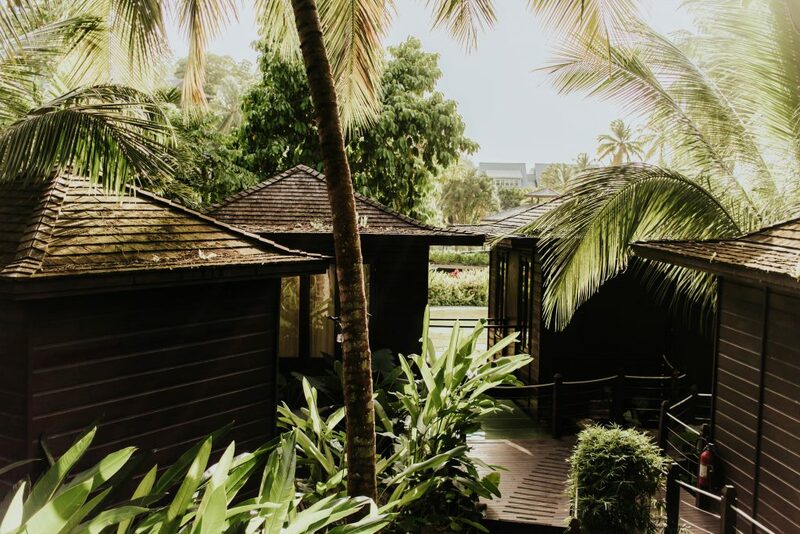 The spa is relaxing and luxurious, nestled amongst the green foliage and featuring natural textures such as wood and rattan. From the list of treatments on offer, my husband and I had the Swedish Couples Massage which was a relaxing and luxurious activity to enjoy together. We certainly left feeling rejuvenated and relaxed! 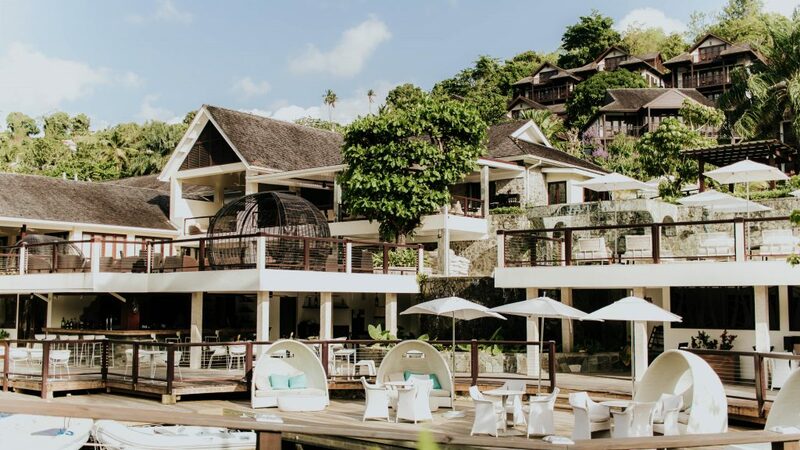 For those wishing to add in a few additional activities to their holiday itinerary, the Marigot Bay Resort and Marina has plenty on offer. We did not get to try them all, but we did enjoy a good selection which all added richly to our holiday memories. 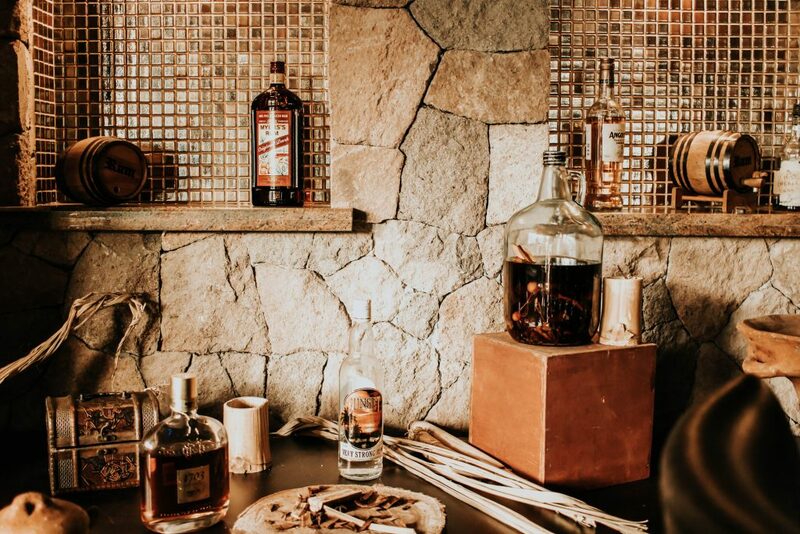 Rum is synonymous with the Caribbean and is served generously at the Marigot Bay Resort and Marina. To really understand and appreciate it, we were invited by the resort to attend the rum tasting at the Rum Cave on our first night at the resort. 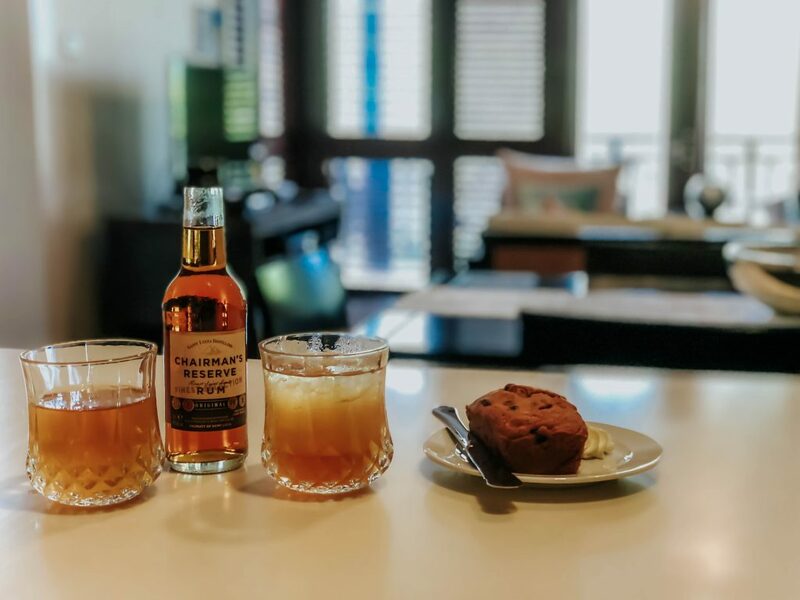 During our tasting, we learnt a lot about the process for making rum and then creating delicious cocktails and other drinks from it. Our bartender and host for the evening was very knowledgeable and personable, and his passion and enthusiasm for rum was fascinating. We also enjoyed sampling different types of rum made in Marigot Bay and the wider Saint Lucia area, including the Chairman’s Rum, Chairman’s Spiced Rum, 1931 Rum and Admiral Rodney. We certainly left with a much greater appreciation for rum, how it is made, and its history in the Caribbean. To find out more about life in Saint Lucia, the resort organised Soufriere Adventure on our second morning during out. 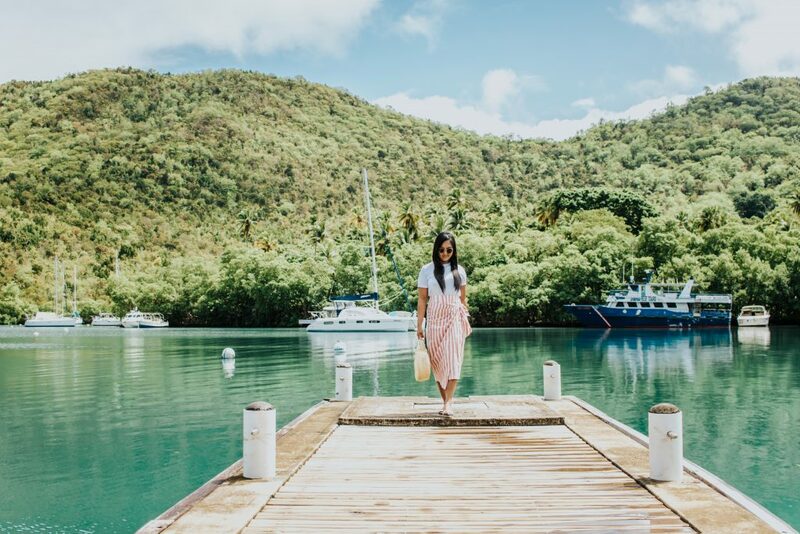 Catching a luxury catamaran, we visited Soufriere, a beautiful town which was originally founded by the French. 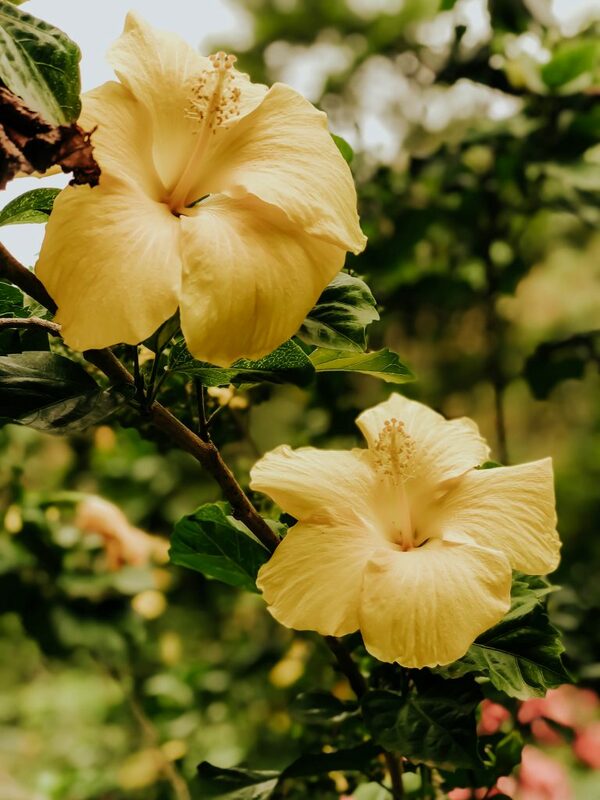 Although the town’s history is in agriculture, its beauty means that today it is tourism that brings the most economic activity to Soufriere. 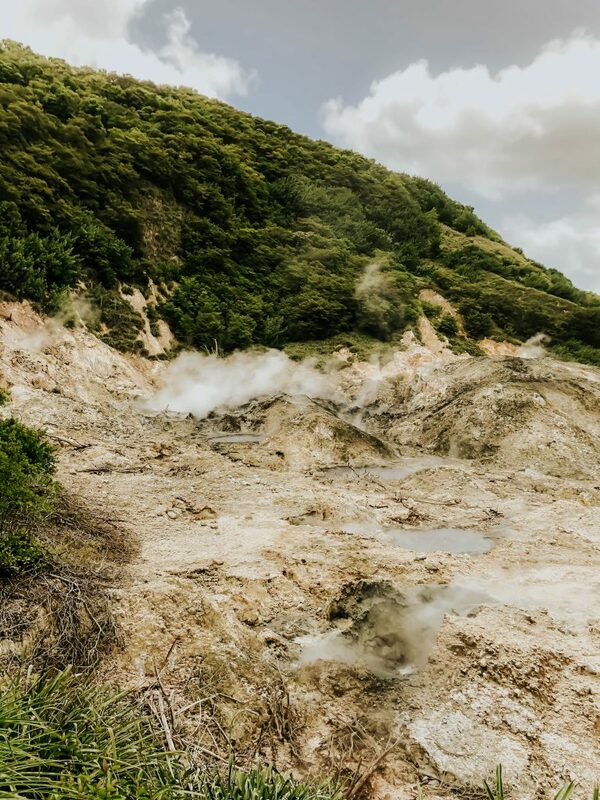 We enjoyed visiting the iconic sulphur springs on our way to the expansive botanical gardens. 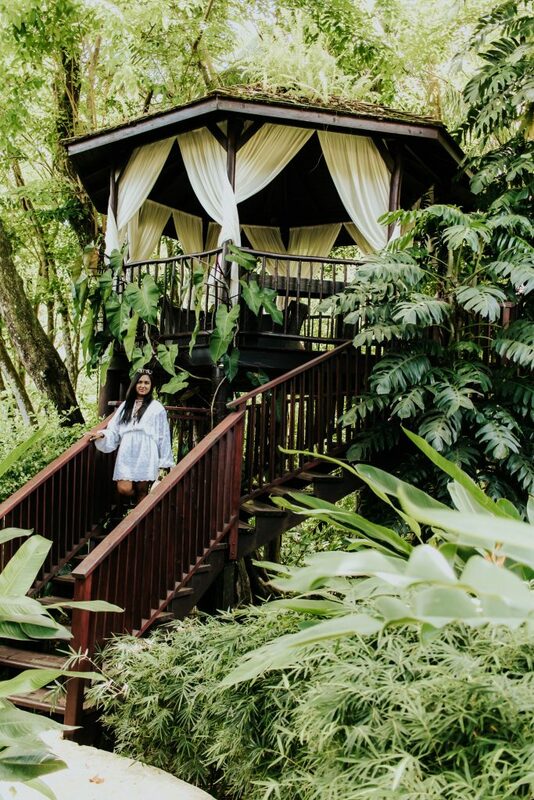 Stepping inside the gardens, we were immediately enveloped in the beautiful natural environment and felt the stress and worry of day to day life evaporate as we enjoyed feeling totally in tune with nature. 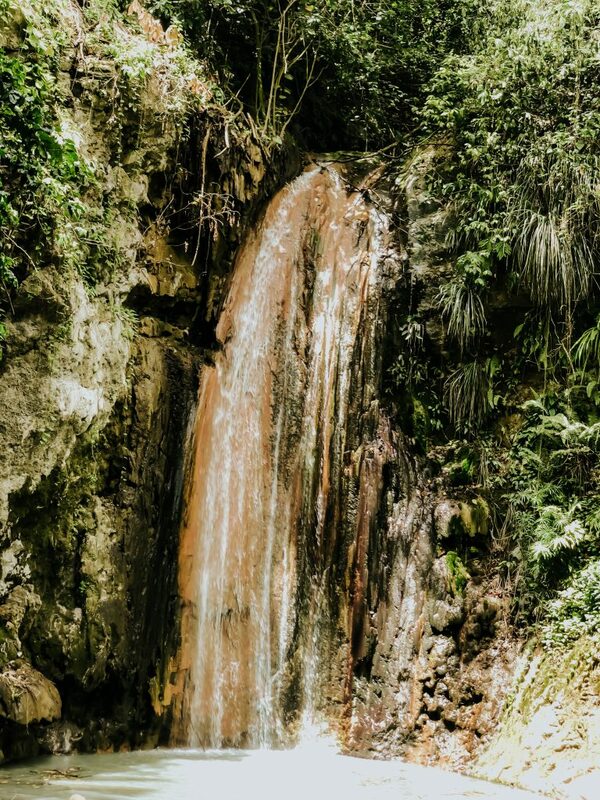 After the gardens, it was on to admire the beautiful Diamond Waterfall, where crystal clear water cascades down the mountainside. Following a lunch stop at a local restaurant, it was back aboard our luxury catamaran and onward to Anse Cochon. 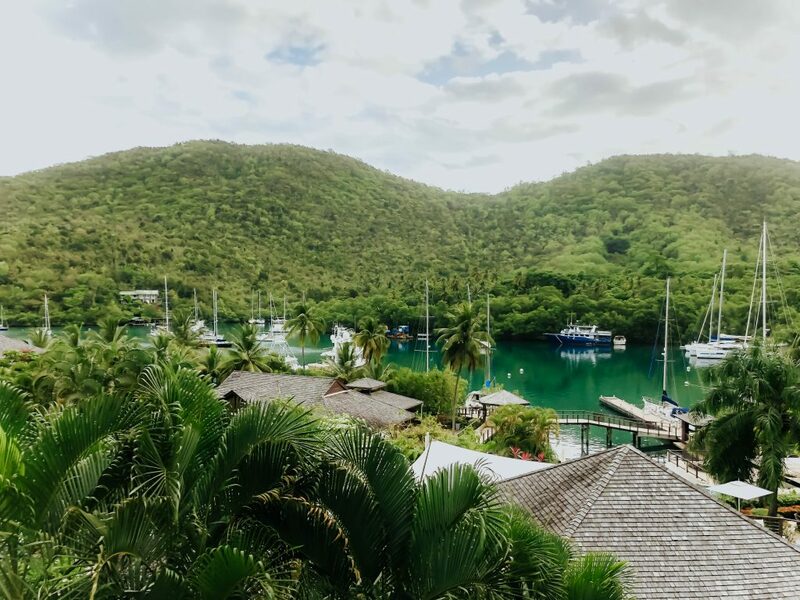 Here, we donned our snorkelling gear and set off in pursuit of the beautiful marine life that calls Saint Lucia home; as we dove into the water from our boat, it was like diving into a tropical aquarium. There were so many colourful fish against a backdrop of white, sandy ocean – it was truly a sight to behold. After this, we returned back to the resort. 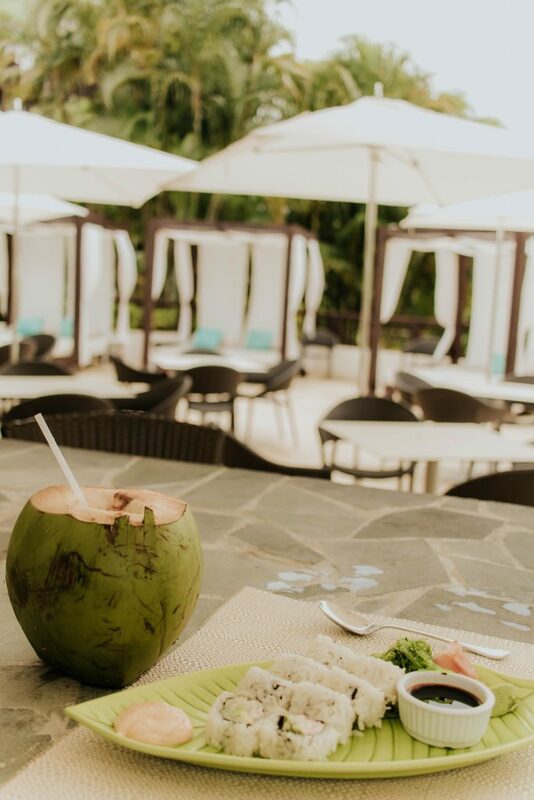 Coconuts hold a special place in the culture and history of Saint Lucia, being a source of nourishment and life for local people for centuries. 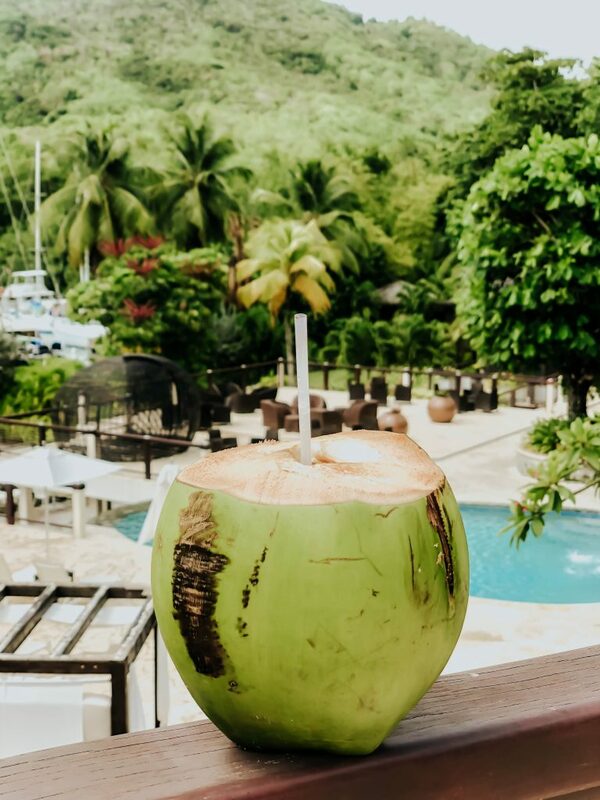 As such, every guest to Marigot Bay Resort and Marina is offered the opportunity to join in the coconut experience and learn more about them and the trees where they grow. During the experience, we learned how the coconut tree is considered the ‘tree of life’, and how its parts (leaves, bark, roots) can be used in traditional medicines and remedies. We also discovered how local people utilise every part of the coconut to ensure nothing goes to waste – using them to make drinks, fiber, food, fuel, utensils and musical instruments. It was an interesting session and I left with a new appreciation for coconuts! 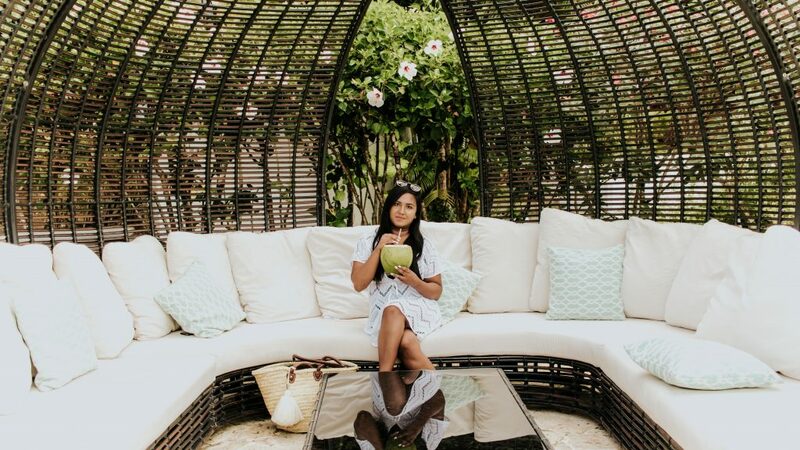 I also enjoyed drinking from a fresh coconut, which is definitely a quintessential tropical getaway experience. Marigot Bay Resort and Marina is a place to enjoy Caribbean’s most beautiful location and luxurious hospitality. The resort itself has had so much thought put into everything, from your personalised welcome beforehand to the little notes left in your room, that simply being there is a magnificent experience. Add delicious dining options and fun, informative activities, and its a beautiful place to relax and enjoy.